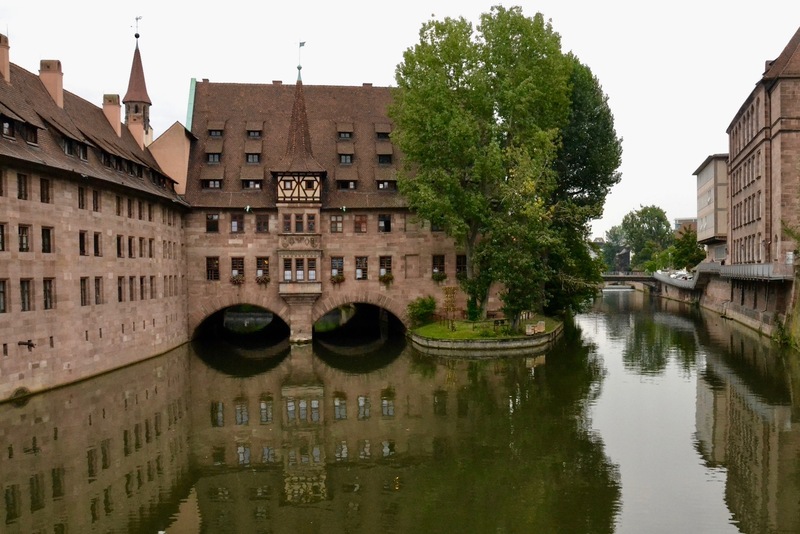 Most people I know don’t associate Nuremberg with river cruising, and neither did I. When I saw that Nuremberg was the starting point of our cruise, I couldn’t wait to see the site of ‘Judgement at Nuremberg’. Then, after learning of the wartime destruction of 90% of the city, I wondered why the Allies had chosen it. It wasn’t a random choice. The Nazi regime, under Adolph Hitler, conceived the ‘Third Reich’ (Empire) when it came to power in January 1933, hoping to evoke the majesty, expanse, and endurance of the Holy Roman Empire. Hitler considered Nuremberg to be the most German of German cities. The Nazi Party had held rallies in various locales since 1923 but once seizing power, Hitler announced that all future rallies would be held in Nuremberg and commenced a program of building around the Rally Grounds, on an existing large park and Zeppelin field to the southeast of the city. The event grew in size and grandeur with each year, providing the perfect propaganda platform. 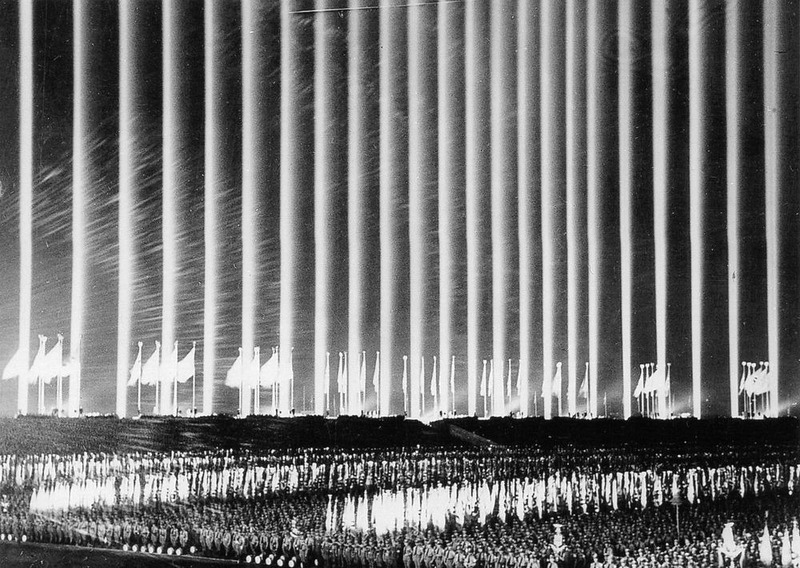 The stadium commissioned for that first year, 1933, couldn’t be finished in time, so the architect Albert Speer placed anti-aircraft searchlights around the perimeter, pointing straight up. This Cathedral of Light became a signature of the Rallies. Still unfinished, the massive Congress Hall at this site now houses a museum that teaches lessons from the Nazi reign of terror. Leni Riefenstahl's controversial masterwork, Triumph of the Will, the pinnacle of propaganda was premiered here at the 1934 Rally. At the following year’s Rally, Hitler introduced the notorious Nuremberg Racial Laws, disenfranchising and isolating German Jews, later extended to Roma (Gypsies) and blacks, stripping them of their citizenship and forbidding other Germans from socializing or doing business with them. This formalized the descent into the Holocaust. At the end of the war little remained of Nuremberg, although the Palace of Justice and its associated substantial prison were still intact. 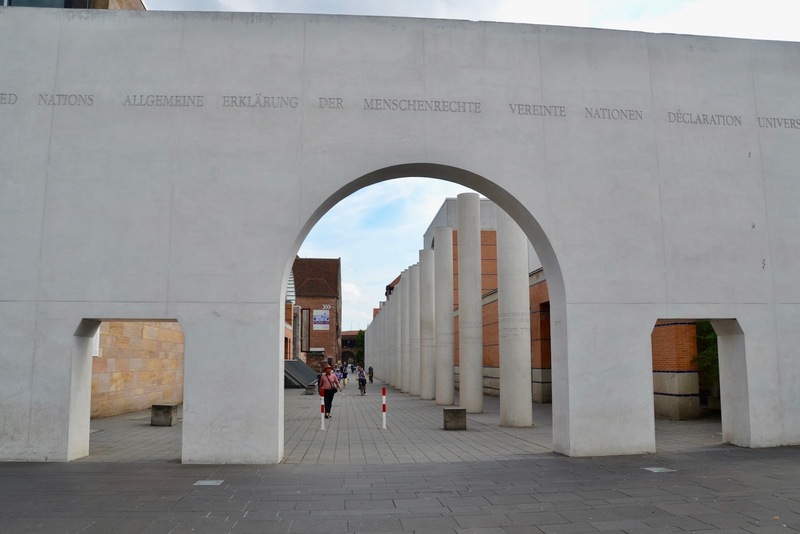 The Allied leadership saw a Trial of Nazi leaders here as a symbolic conclusion to the regime, eventually hosting a series of trials that essentially established international law and the principle of crimes against humanity. The courthouse is still there; I couldn’t believe my luck at having the opportunity to see this ‘holy grail’ of justice. As soon as the heat of the day had subsided on our first evening, I set off. I went alone and dressed in a T-shirt, shorts and sandals (no socks). I figured it would be a short walk… …I was wrong. 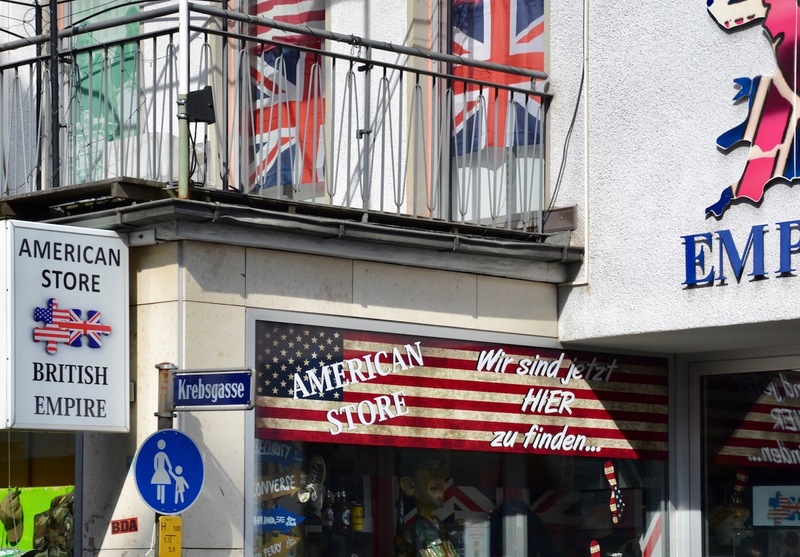 It grew darker as I walked, and walked; I was about to give up when I saw a sign that said ‘Memorium Nurnberger Prozesse.’ A little further and there it was, set back on a side street. It’s still in daily use as a courthouse and is only open to tourists on the weekend – it was a Tuesday! I took a couple of photos in the failing light and headed back to the hotel. But it had started to rain and quickly turned into a thunderstorm. I got soaked to the skin as I struggled to keep my camera dry. ‘Why didn’t you jump in a cab?’ I hear you say. Well, in my eagerness, I’d forgotten my wallet. Next day, dominating the street beside the Municipal Museum in the old city, we saw the monumental sculpture the Way of Human Rights. 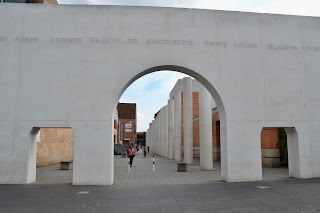 This memorial, illustrates the United Nations International Declaration, each clause with its own pillar, the wording etched in the German language and one other; one pillar in French, one in Japanese, and so on. But, it was time to go. We took one last view at the River Pegnitz and it was off to meet our cruise boat at the dock on the Danube. Tomas returned and picked us up. Some very dark tames in Europe's pasts. And hatred lives hidden under the surface for a long time. One of the reasons the EU was formed was to remove some of the grudges between countries. Let's hope it continues to work. I hope so too. One of the reasons I was disappointed by the UK’s Brexit vote.